How Much Does Wallpaper Cost in 2019? 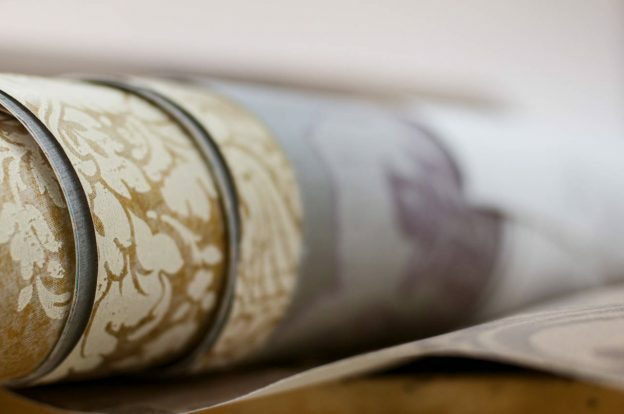 We can trace the use of wallpaper back for centuries. In fact, the Chinese glued rice paper to their walls as far back as 200 BC. The use of wallpaper declined for several decades in the twentieth century, but since 2000, it has been making a comeback. Many designers and homeowners on a budget use wallpaper in kitchens and baths rather than a backsplash, as a feature wall to add a little excitement of contrast, or to compliment three other plain painted walls. The benefit of most wallpaper over paint is that it last 15-20 years, it is much easier to clean than paint, and it adds a little something to otherwise boring painted walls. Wallpaper costs on average from $500 for a smaller DIY project to $1,500 for a more premium product with installation, and most spend right around $1,000. The cost of wallpaper to cover your walls will depend primarily on four variables: the amount of wallpaper needed, the drop-pattern, the type of wallpaper selected, and the cost of labor. To estimate the actual cost of wallpapering a room or wall, you must first determine the square footage of the area to get covered, then figure the number of rolls you will need based on that coverage and the amount of usable wallpaper per roll. The more of the wall that will be covered will obviously impact the cost, but the way wallpaper is sold will also impact the cost. Although wallpaper gets priced by the single roll, which is 21″ x 6.5′, it is widely sold by the double-roll. Therefore, in most instances, you could not buy five rolls but would need to round up to six. The drop-pattern will have a significant effect on cost if you are covering a large area. Normally, wallpaper without a drop-pattern will cover 29 to 36 square feet per roll. However, with a drop-pattern of 19″ to 23″ you will only cover 15 square feet per roll at $45 to $100 per roll, which makes a substantial difference. Likewise, the cost of labor significantly increases when using a drop-pattern because of the time required to match the pattern and make the cuts. There are several well-known wallpaper types with advantages and disadvantages, depending on where you will hang it, the amount of moisture, heat, and traffic the area will be exposed to on the wall where it will get hung. By understanding the properties and expense of each choice, you can make a more informed decision of what is appropriate for the space you intend to cover. Paper wallpaper is one of the most widely-used versions because of its simplicity, low cost, and ease of hanging. It comes in a wide variety of thicknesses, designs, and textures to meet your requirements. There are essentially three variants of paper wallpaper, simplex (one layer of paper), duplex (two layers), and woodchip (two layers of wood fiber). Non-woven wallpaper gets manufactured with synthetic, paper, or textile fibers. These wallpaper products are light, yet sturdy and durable. Plus, you can easily paint right over these with a minimum of two coats. Vinyl wallpaper comes in a variety of styles, textures, and durability levels. You will have the choice between vinyl coated, solid sheet vinyl, coated fabric, and fabric-backed vinyl wallpaper rolls. Vinyl wallpaper is exceptionally durable and near water-proof, though in many cases it can be difficult to remove and painful to paint over. Improved moisture resistance makes vinyl coated wallpaper more suitable for kitchens and baths. Solid sheet vinyl is a paper substrate with acrylic lamination, which is often embossed to add texture to a single decorated sheet that is a robust and long-lasting wall cover. Patterns get printed directly onto coated fabric wallpapers making these high-quality, breathable best-selling wallpapers very popular despite the more substantial price tag. However, these are not well-suited for the kitchen or bath because these paper backed products absorb moisture. Due mainly to its costly nature and high-traffic use, fabric-backed vinyl commonly gets used for commercial applications like hotel lobbies and rooms. However, it is also an excellent choice for home entertainment areas and playrooms. Except for the vinyl coated and solid sheet, vinyl wallpaper removal can be more challenging than paper. Steamers usually do no good because vinyl is moisture resistant. Exotic wallpapers can cost as much as $400 per roll. Grasscloth wallpaper averages $80 – $125 per roll, faux leather $300 – $350 per roll, and some silks cost $150 – $400 per roll. A major cost factor in a wallpaper project is the cost of labor. Whatever the price of the wallpaper, you can often figure to pay twice that for installation. However, some wallpaper hangers charge a flat fee or an hourly, per person wage to hang wallpaper. Installation rates will also vary geographically and by skill level, so we suggest getting some estimates to more accurately gauge the price of the project. Get three to five estimates, compare work references, price, and promised work before selecting the best candidate for your project. Our calculators and project planning cost guides are a great resource for your painting, wallpaper, drywall projects.